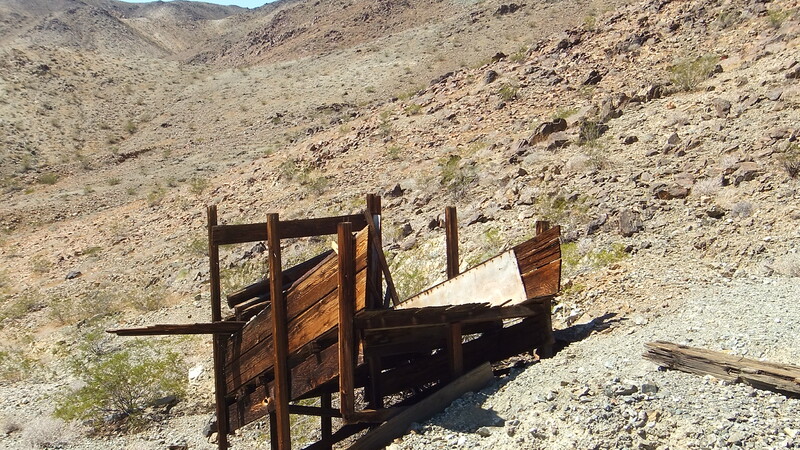 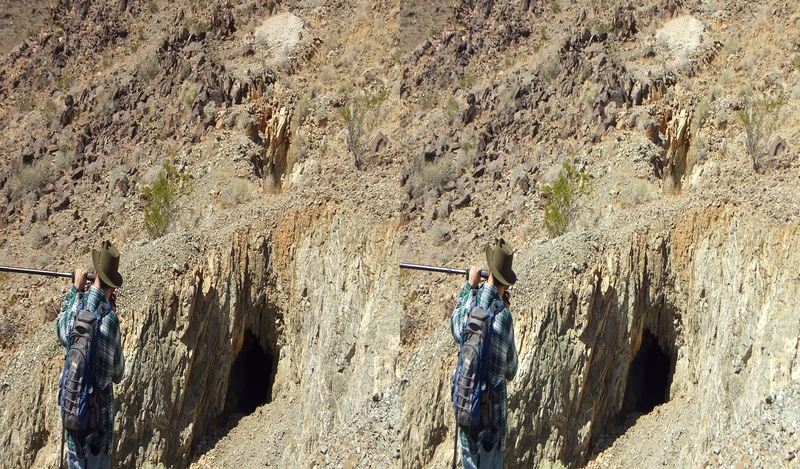 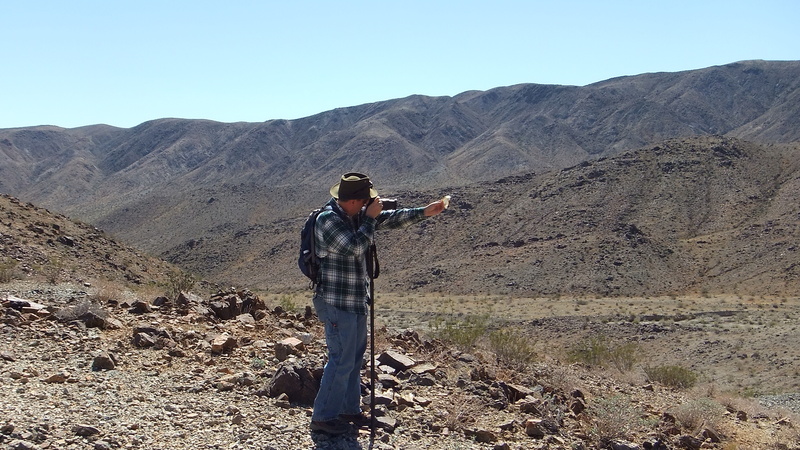 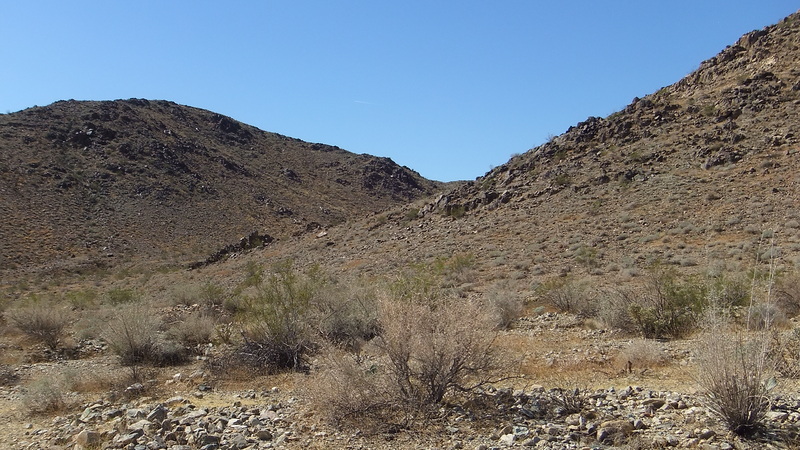 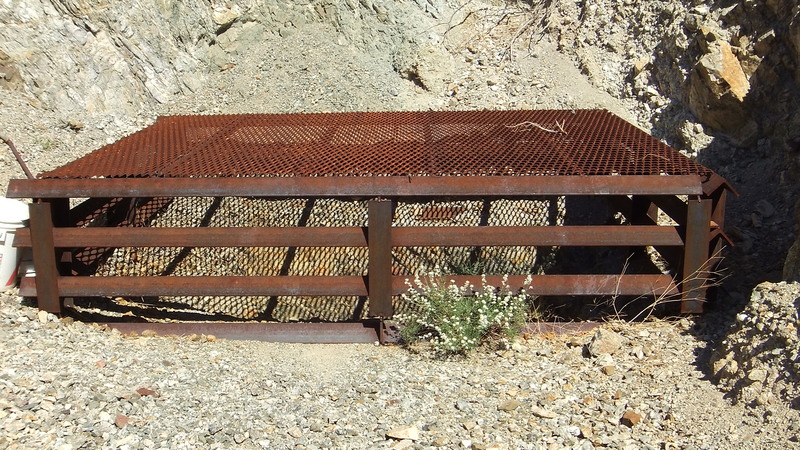 SEVERAL LATERAL DIGS AND A DEEP MINE SHAFT are the telling reminders that there was once gold mining in the Hexie Mountains of Joshua Tree National Park. 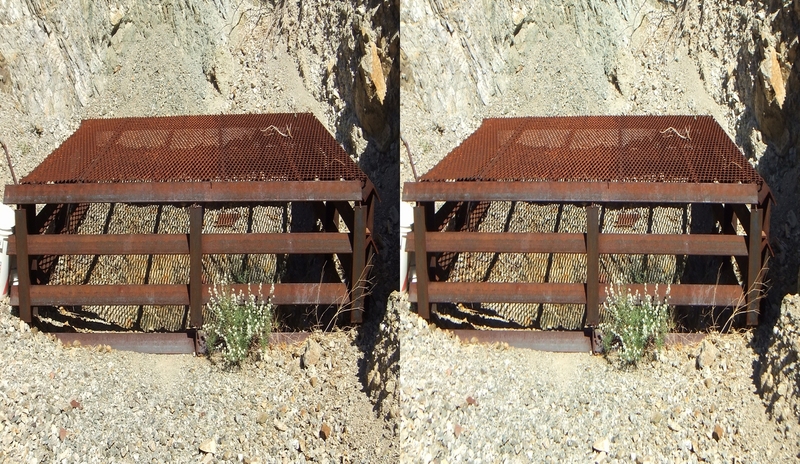 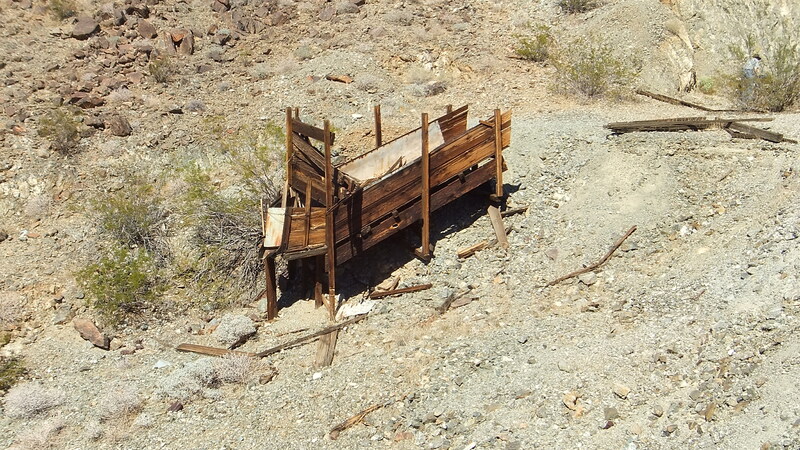 Tucked back up a desolate, hardscrabble-strewn canyon lie the ruins of the modest-sized Golden Bell Mine operation. 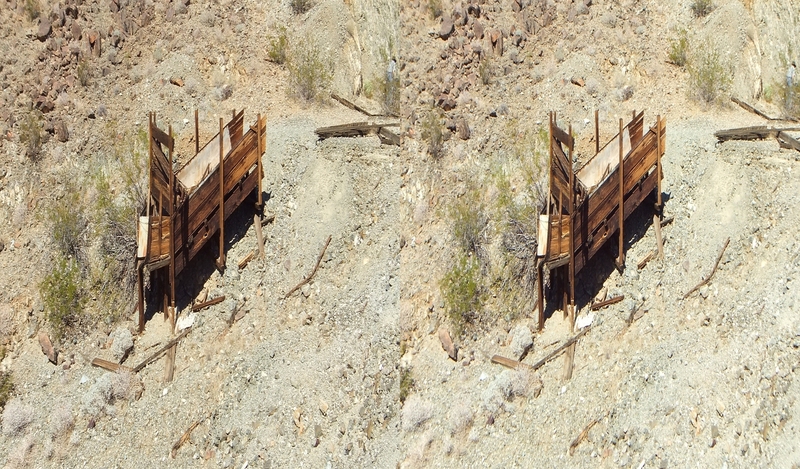 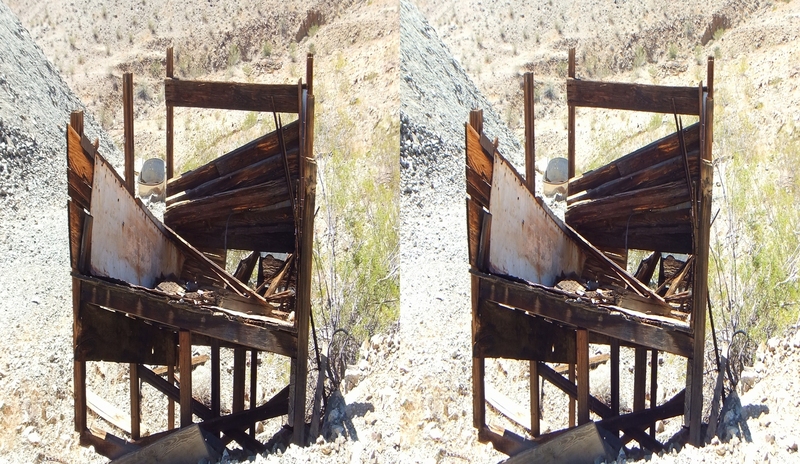 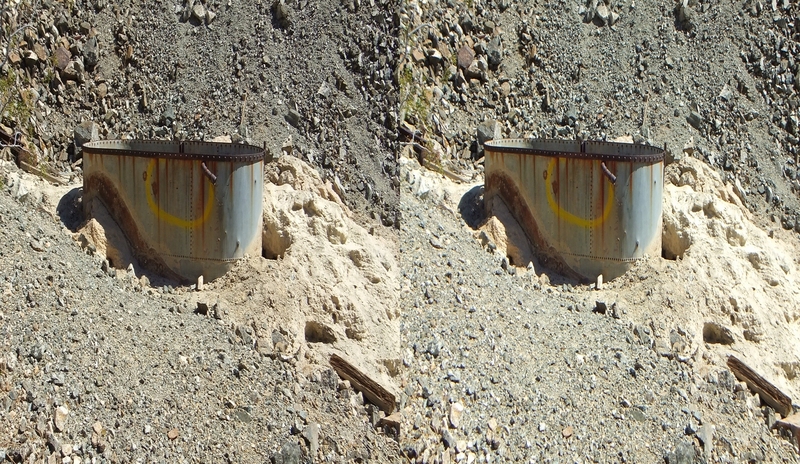 Little remains other than the main mine shaft, scattered lateral shafts and tailing piles scattered about the hillsides on either side, an ore chute and water or cyanide tank, plus a collapsed wooden structure. 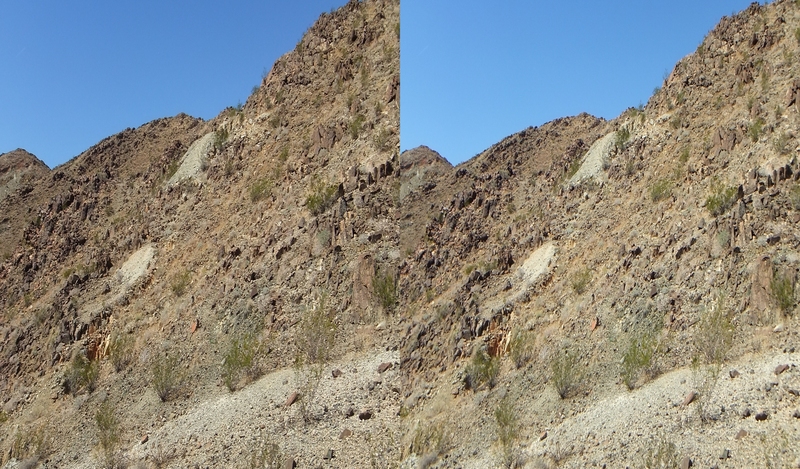 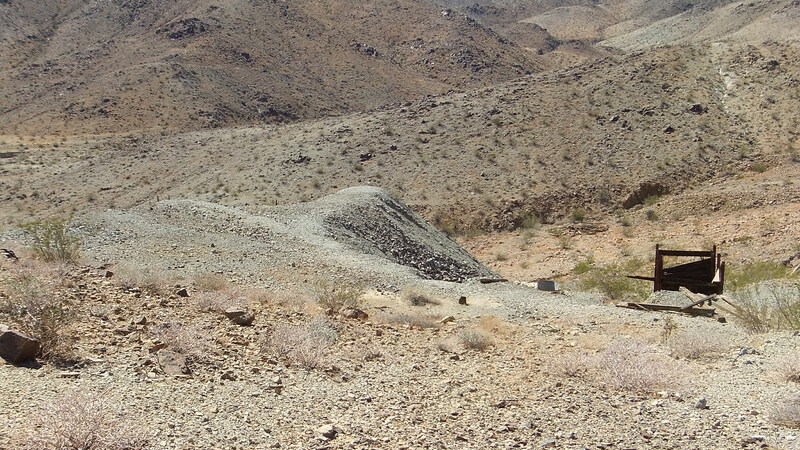 Further down the slope from the main dig can be found a few camp sites delineated by rocky outlines on the desert floor. 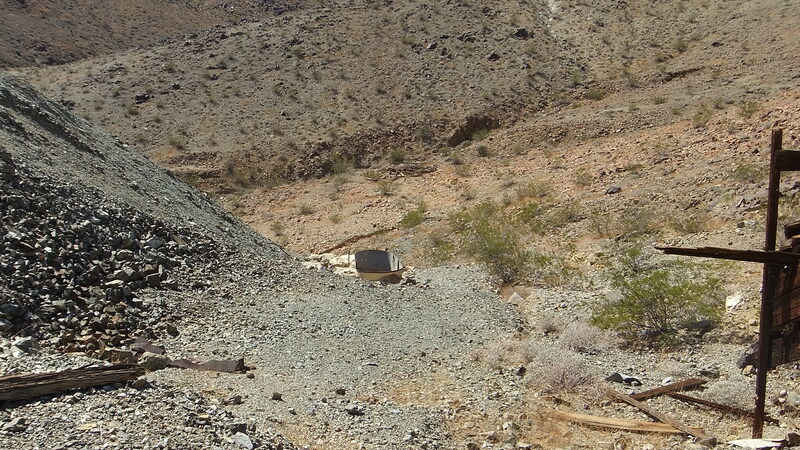 Several small mining concerns operated here into the 1930s. 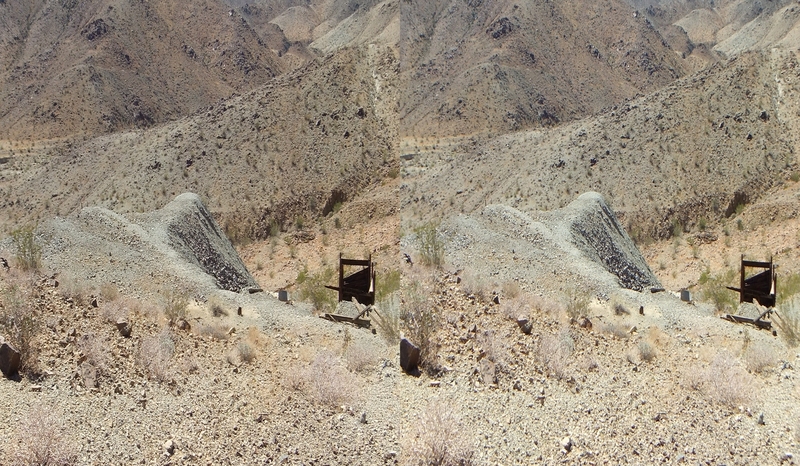 The more extensive Silver Bell Mine works can be seen about half a mile distant along the ridge crest west of Golden Bell. 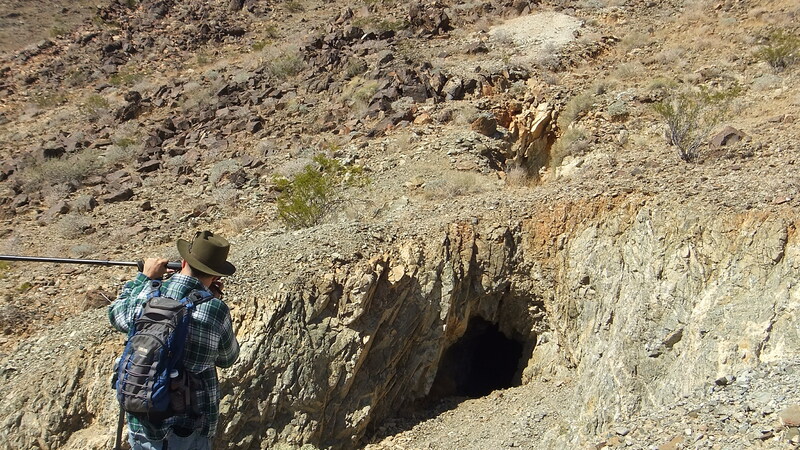 Elliot Koeppel and I visited the Golden Bell in February, 2016. 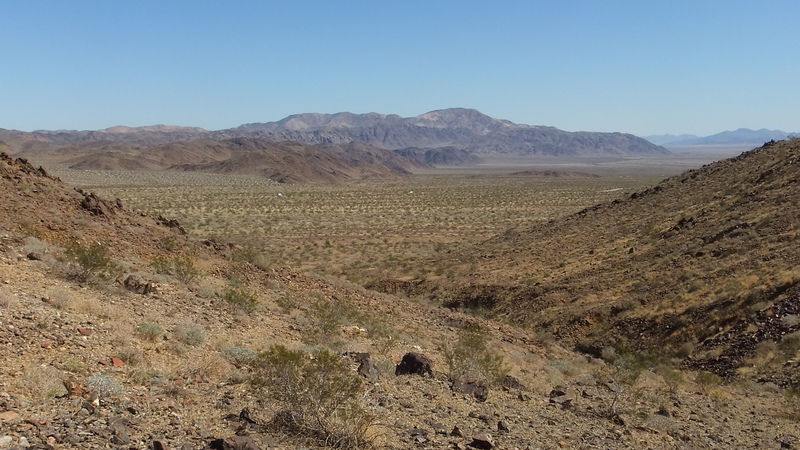 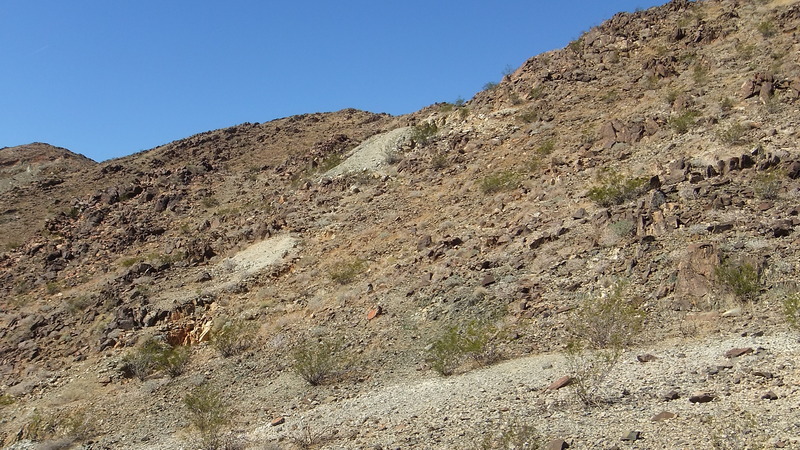 The 0.7 mi approach is from Pinto Basin Road across a large wash and through a canyon. 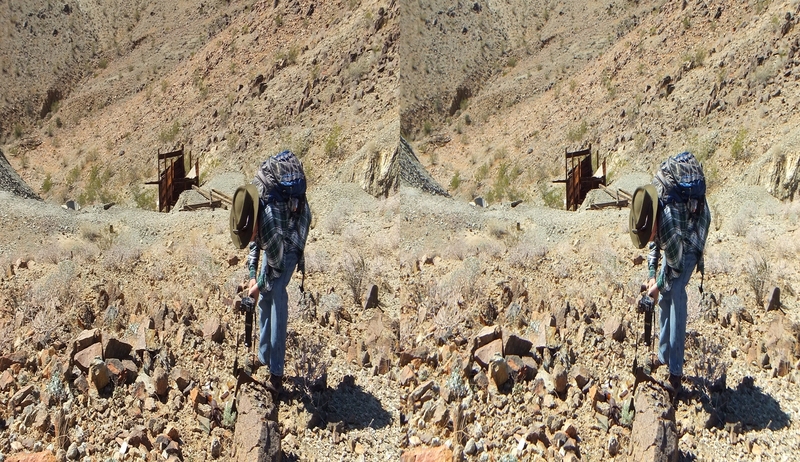 Follow an old dirt road up the right side of the canyon. 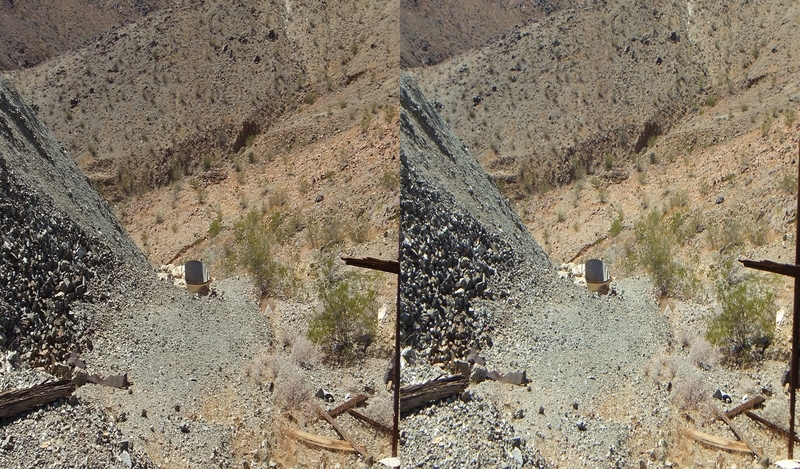 The incline is moderate, with slightly more than 200ft elevation gain to a saddle-area where the main shafts and ore chute are located. 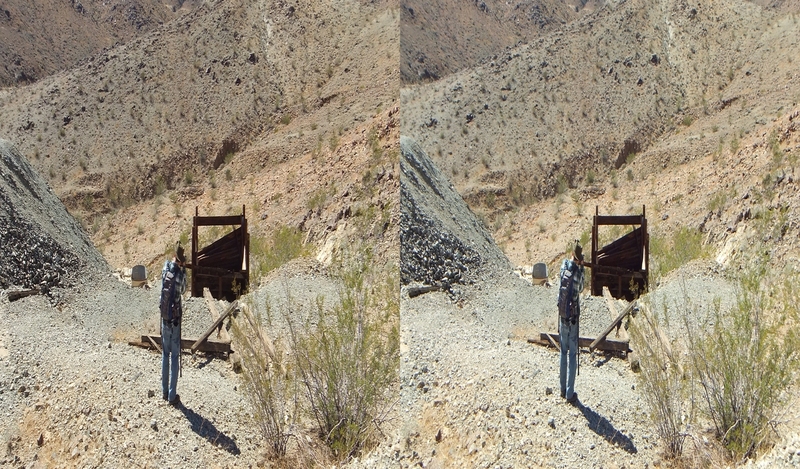 Elliot Koeppel’s Golden Bell Mine and Golden Bee Mine pages. 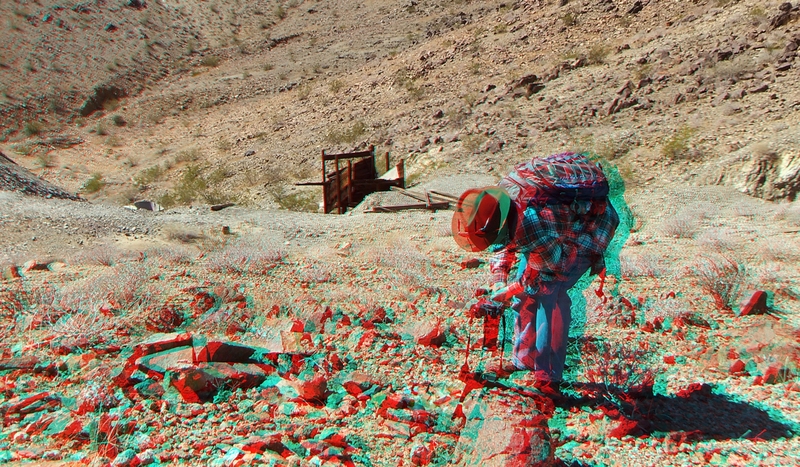 Be my guest and download as many of the 3D Anaglyph or 3D Half Side-by-Side photographs as you wish. Note: 3D H-SBS images should only be saved for viewing if you have access to a 3D TV. 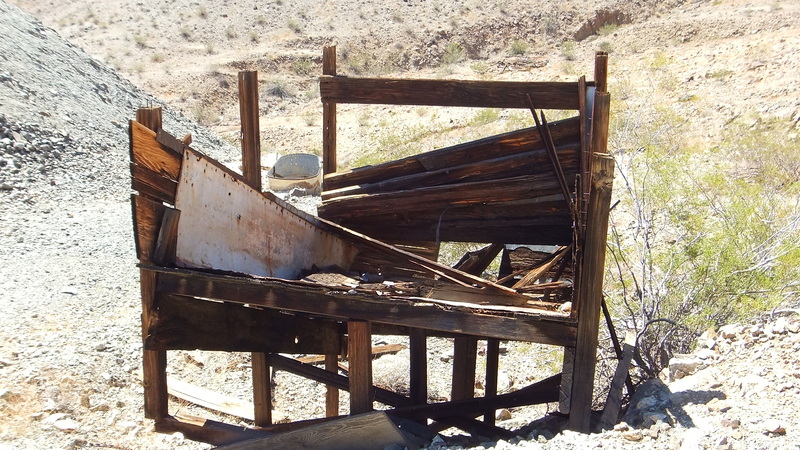 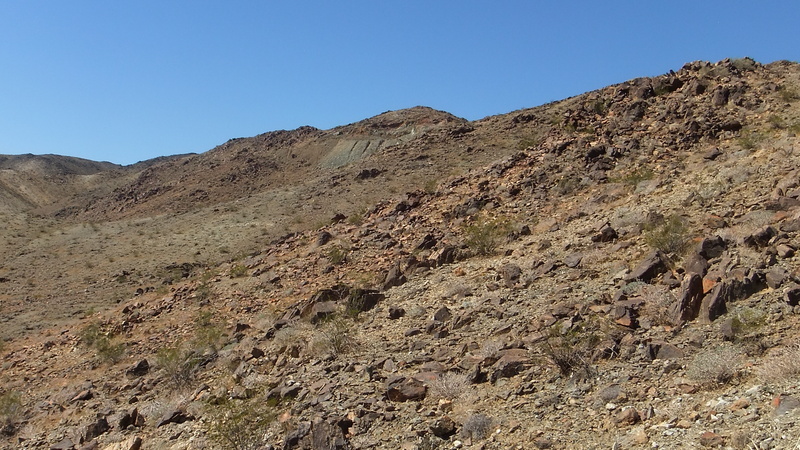 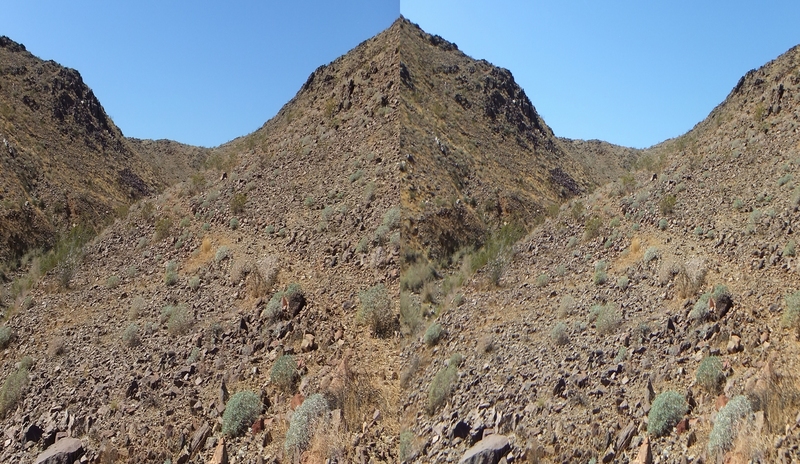 A wonderful two-hour excursion to the Golden Bell Mine ruins and back. 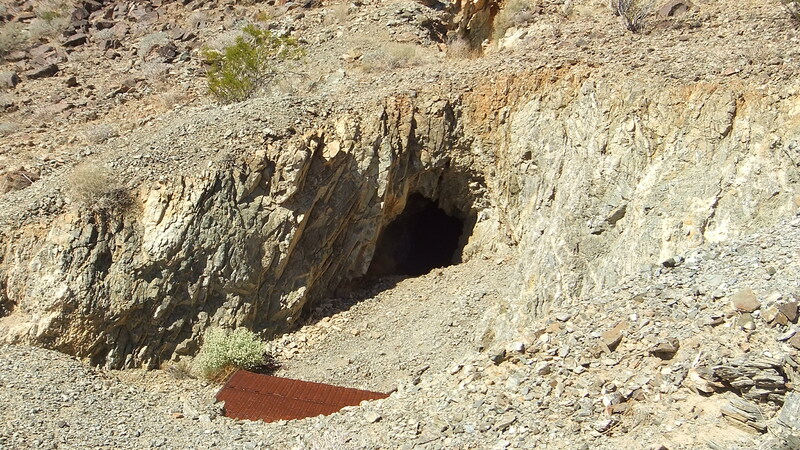 There is no shade in the area, therefore come prepared for direct sunlight the whole time. 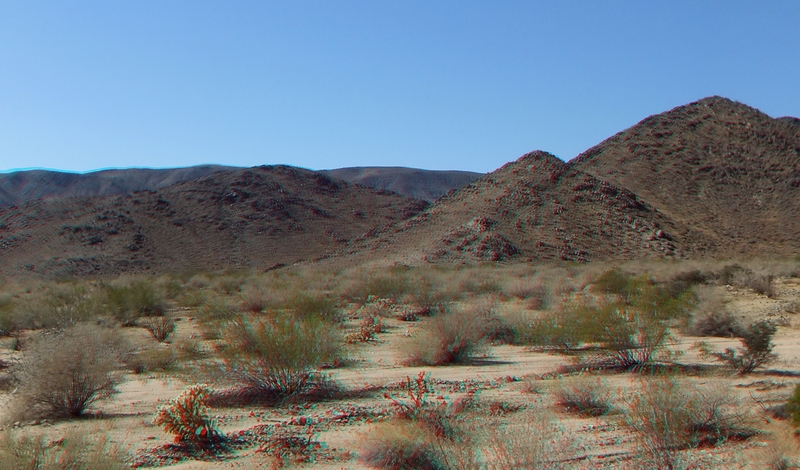 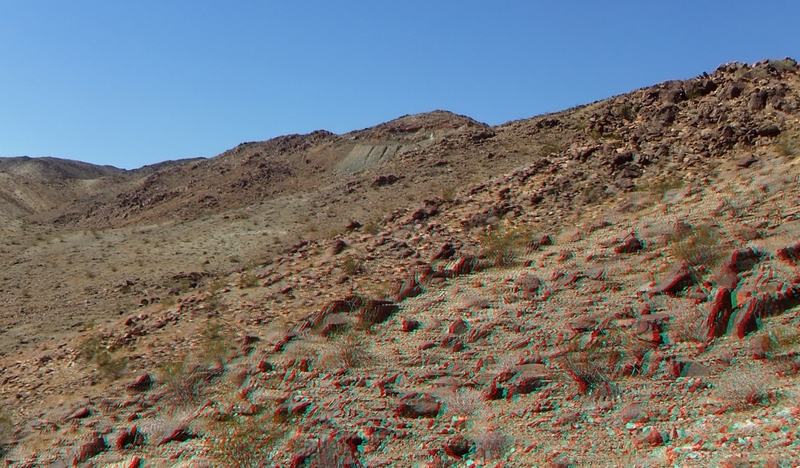 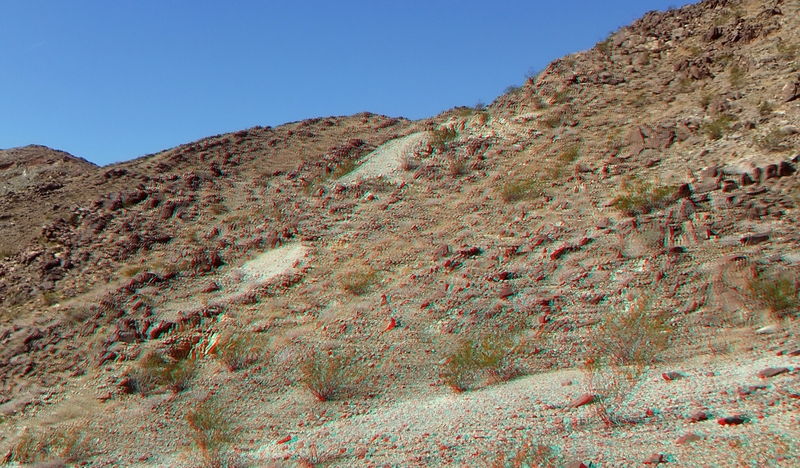 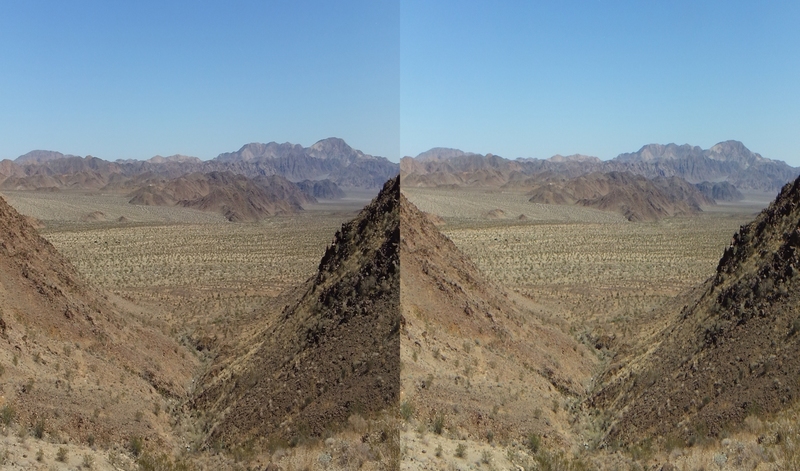 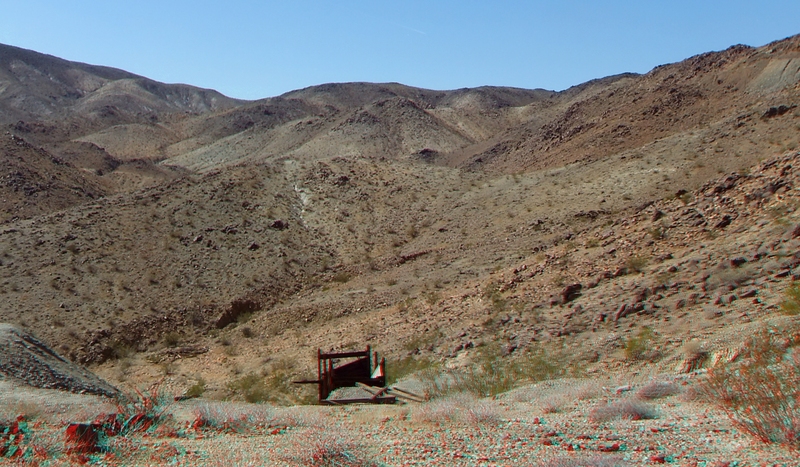 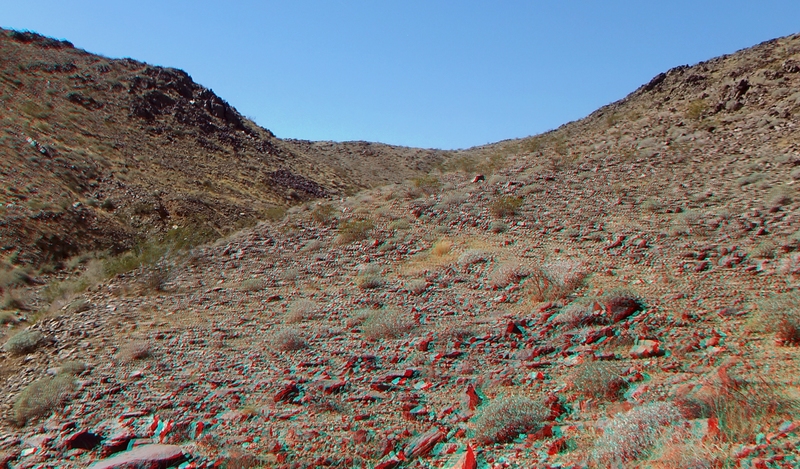 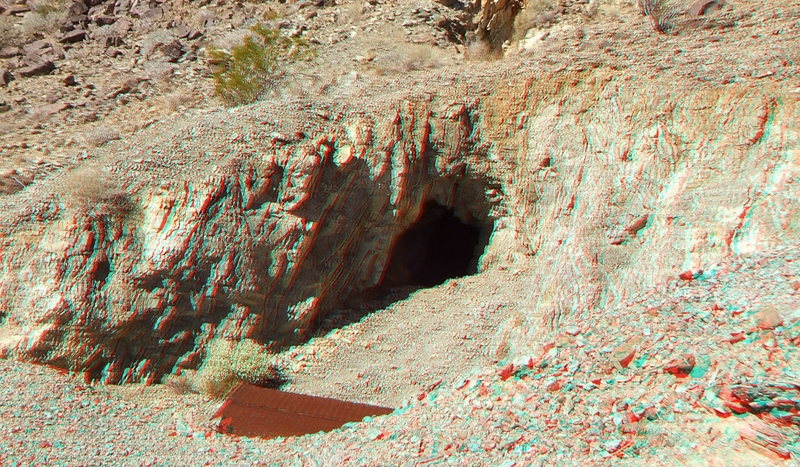 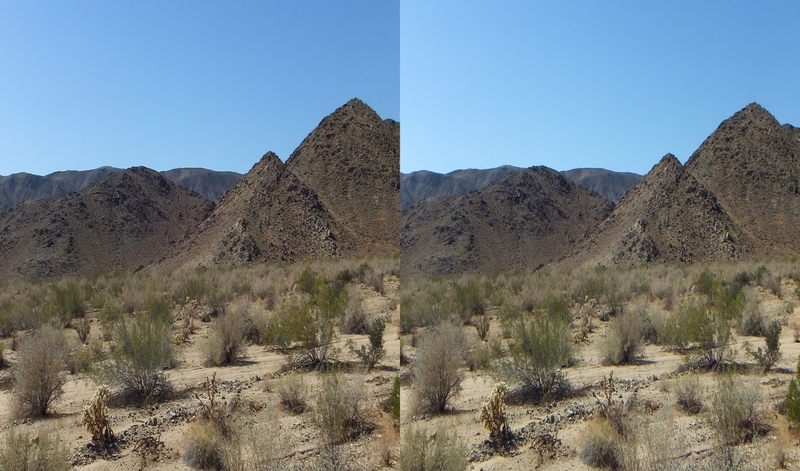 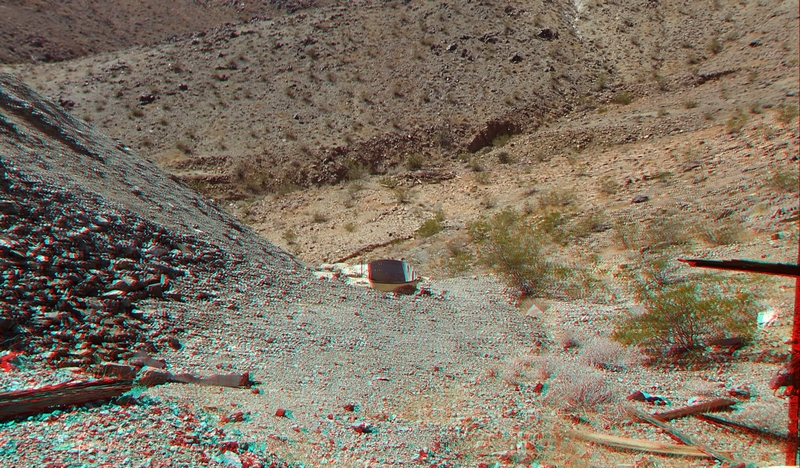 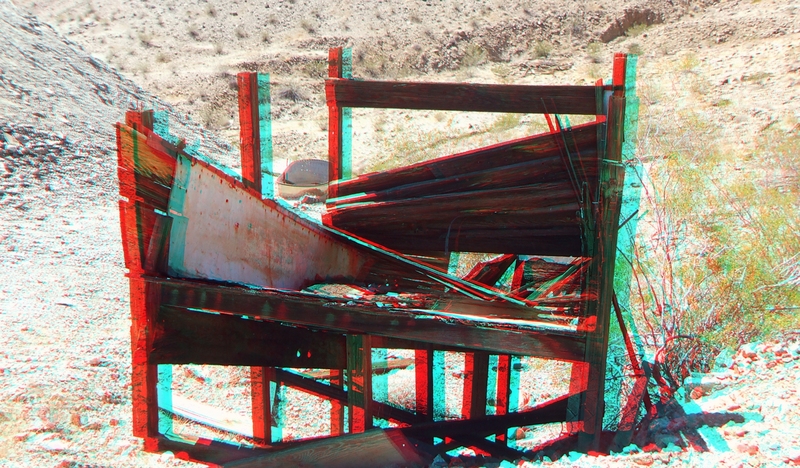 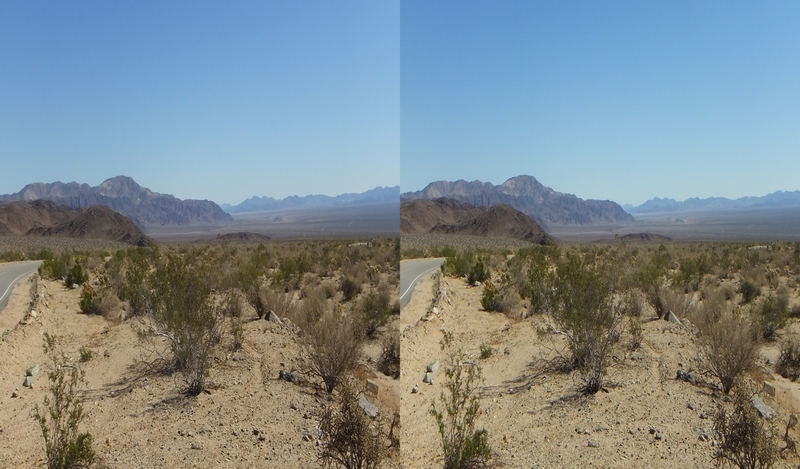 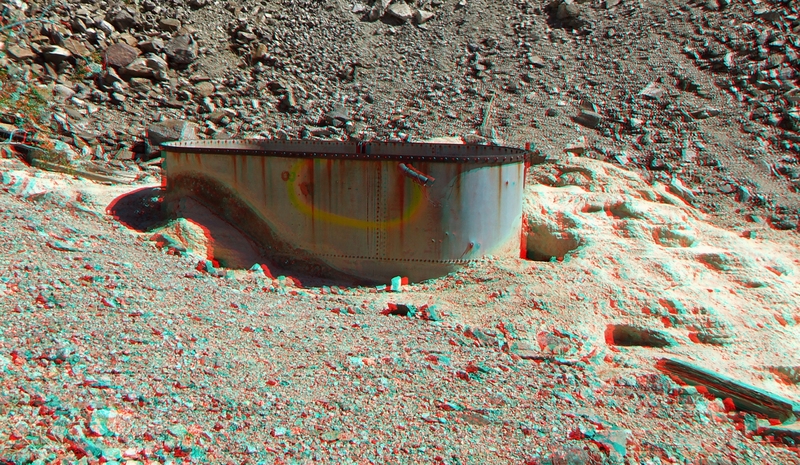 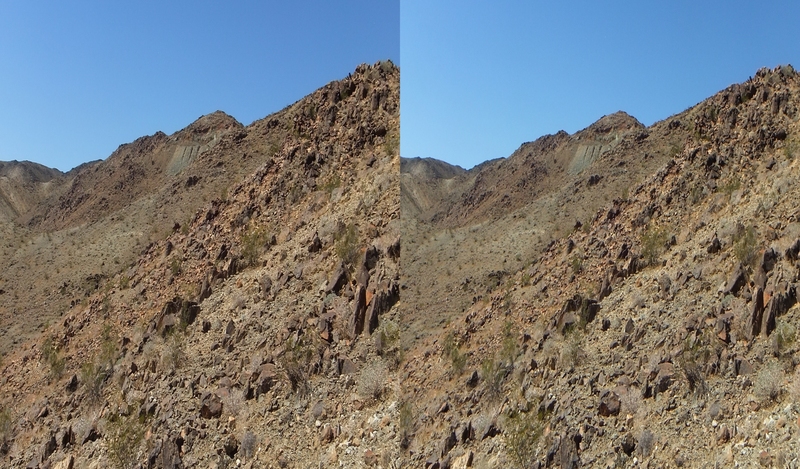 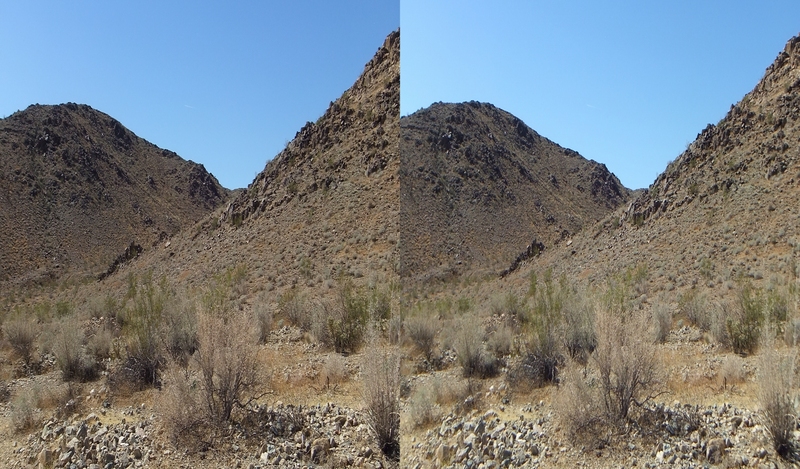 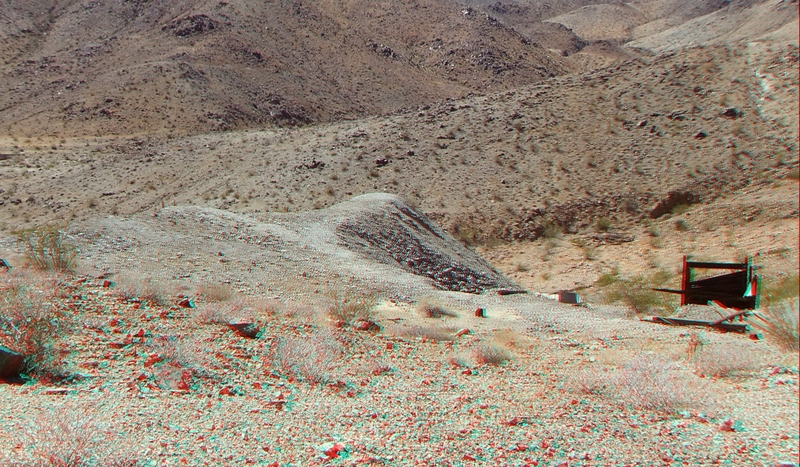 Thank you for visiting Joshua Tree 3D.